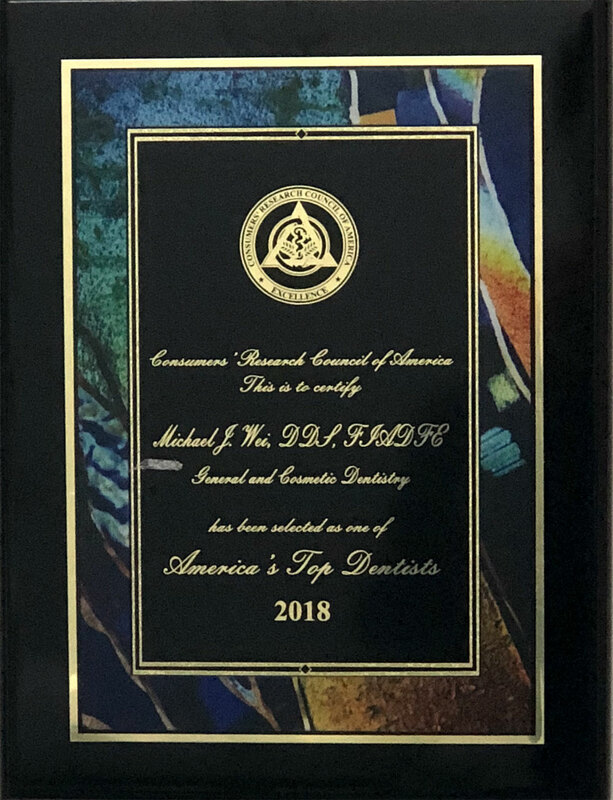 Midtown Manhattan cosmetic dentist Dr. Michael J. Wei has been named America’s Top Dentist for 2018. 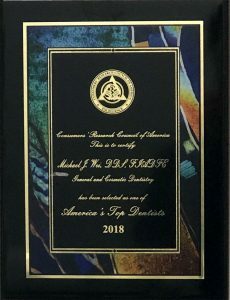 An award given to dentists who consistently provide exceptional dentistry services and outstanding treatment to their patients, this honor is awarded by the Consumers’ Research Council of America. 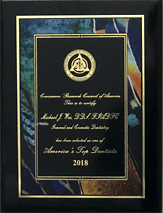 This recognition marks the 14th consecutive year that Dr. Wei has been given this accolade. Dr. Wei is well-known among his peers as a cosmetic dentist with extensive clinical expertise and dedication to his craft. At his Midtown Manhattan practice, he is committed to delivering top-quality care and artistry for every procedure and every smile makeover. “No matter how large or small an improvement to a smile, every patient I see and every bit of work that I do is significant. Good oral health is critical, and feeling good about your smile is just as essential. I am privileged to provide the path to both,” says Dr. Wei. An accomplished cosmetic dentist, restorative dentist, and general dentist, Dr. Wei is a meticulous, understanding, and gentle dental professional. His New York City dental office is a place that offers comprehensive oral health care, which is an incredible convenience for busy Manhattanites. 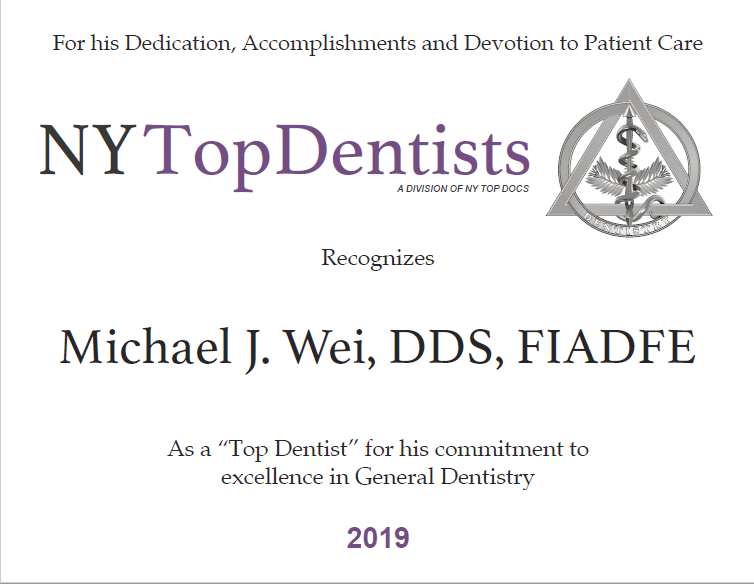 Dedicated to progress in dentistry, Dr. Michael J. Wei uses innovative dental techniques, working closely with his dental lab to ensure that his dental solutions are developed according to his vision and executed to his patients’ expectations. He is conscious of delivering the most suitable dental treatments to each person based on their current oral health, oral health history, budget, goals, and schedule. Every smile makeover is custom-made so that the results look natural, feel comfortable, and are fully functional. A smile must look good, but it must also work well to be a complete success. Porcelain veneers: Five-star, celeb-worthy smiles are made using porcelain veneers. Dr. Wei designs these whisper-thin shells of porcelain so meticulously they are complementary in size, shape, color, and level of translucency. Veneers do not look like veneers in Dr. Wei’s hands – they look like completely natural teeth. Porcelain crowns: Dental crowns are an overlooked restorative dentistry treatment, but Dr. Wei knows their value. Crowns can be used in a variety of oral health situations, whether they’re acting as a repair or an enhancement, an accompaniment to root canal therapy or an anchor for a dental bridge. Smile makeovers: A smile makeover is whatever you want it to be, and there are no two smiles alike in Dr. Wei’s office because no two patients are alike. Whether you are only getting professional teeth whitening, or whether you need an entire overhaul of your smile, from gum disease treatment to dental implants to Lumineers, a new smile qualifies as a smile makeover. The result, of course, is a smile you’re proud to show off. Dr. Wei is a member of the American Academy of Cosmetic Dentistry, the American Dental Association, the New York State Dental Association, and the New York County Dental Society. In private practice since 2002, Dr. Wei has been in his Midtown Manhattan dental office since 2007. He is in constant pursuit of advanced dental continuing education, completing training at prestigious dental institutes such as The Rosenthal Institute for Aesthetic Dentistry in New York and the Las Vegas Institute. Make your appointment with America’s Top Dentist in Midtown Manhattan. Contact Dr. Michael J. Wei today.